Golang library for computing a matrix profiles and matrix profile indexes. Features also include time series discords, time series segmentation, and motif discovery after computing the matrix profile. Visit The UCR Matrix Profile Page for more details into matrix profiles. Going through a completely synthetic scenario, we'll cover what features to look for in a matrix profile, and what the additional Discords, TopKMotifs, and Segment tell us. We'll first be generating a fake signal that is composed of sine waves, noise, and sawtooth waves. We then run STOMP on the signal to calculte the matrix profile and matrix profile indexes. signal: This shows our raw data. Theres several oddities and patterns that can be seen here. matrix profile: generated by running STOMP on this signal which generates both the matrix profile and the matrix profile index. In the matrix profile we see several spikes which indicate that these may be time series discords or anomalies in the time series. corrected arc curve: This shows the segmentation of the time series. The two lowest dips around index 420 and 760 indicate potential state changes in the time series. At 420 we see the sinusoidal wave move into a more pulsed pattern. At 760 we see the pulsed pattern move into a sawtooth pattern. discords: The discords graph shows the top 3 potential discords of the defined subsequence length, m, based on the 3 highest peaks in the matrix profile. This is mostly composed of noise. 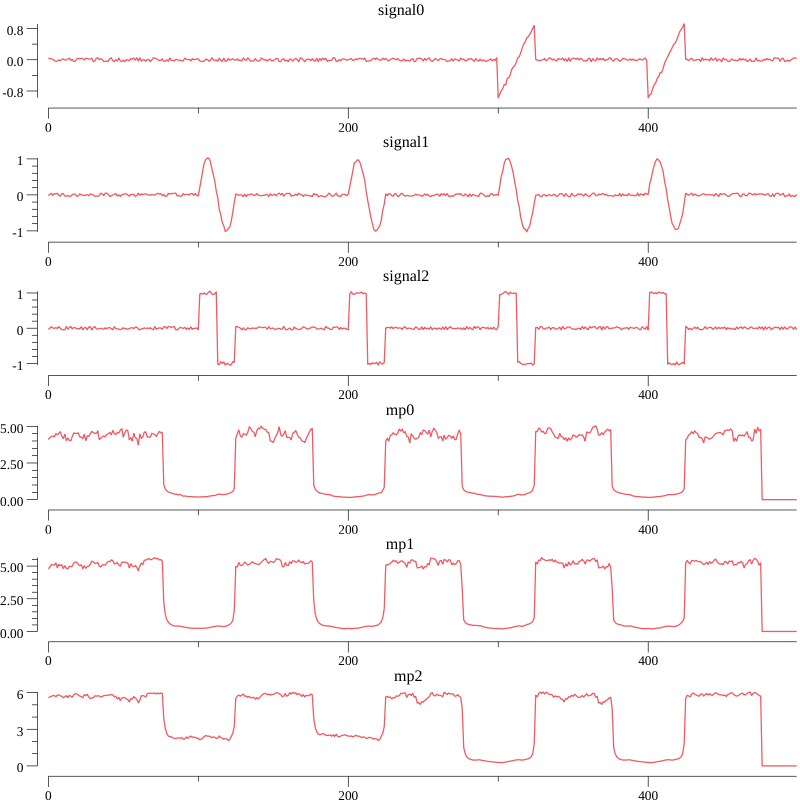 motifs: These represent the top 6 motifs found from the time series. The first being the initial sine wave pattern. The second is the sinusoidal pulse. The third is during the pulsed sequence on a fall of the pulse to the noise. The fourth is during the pulsed sequence on the rise from the noise to the pulse. The fifth is the sawtooth pattern. The code to generate the graph can be found in this example. Based on  we can extend the matrix profile algorithm to multi-dimensional scenario. matrix profile 0-2: the k-dimensional matrix profile representing choose k from d time series. matrix profile 1 minima represent motifs that span at that time across 2 time series of the 3 available. matrix profile 2 minima represents the motifs that span at that time across 3 time series. The MIT License (MIT). See LICENSE for more details. Chin-Chia Michael Yeh, Yan Zhu, Liudmila Ulanova, Nurjahan Begum, Yifei Ding, Hoang Anh Dau, Diego Furtado Silva, Abdullah Mueen, Eamonn Keogh (2016). 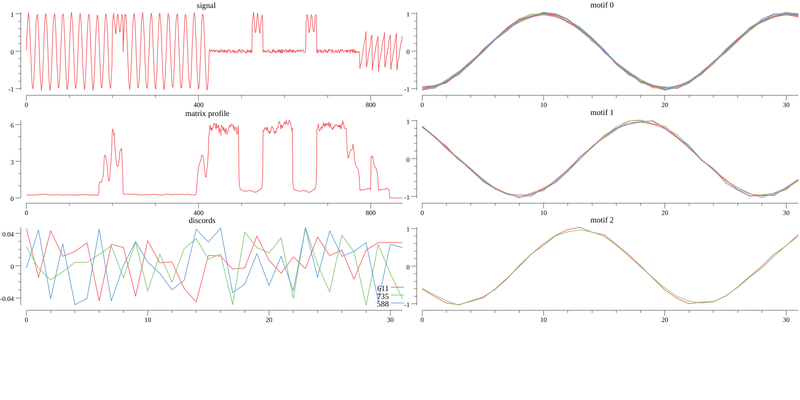 Matrix Profile I: All Pairs Similarity Joins for Time Series: A Unifying View that Includes Motifs, Discords and Shapelets. IEEE ICDM 2016. Yan Zhu, Zachary Zimmerman, Nader Shakibay Senobari, Chin-Chia Michael Yeh, Gareth Funning, Abdullah Mueen, Philip Berisk and Eamonn Keogh (2016). Matrix Profile II: Exploiting a Novel Algorithm and GPUs to break the one Hundred Million Barrier for Time Series Motifs and Joins. IEEE ICDM 2016. Hoang Anh Dau and Eamonn Keogh (2017). Matrix Profile V: A Generic Technique to Incorporate Domain Knowledge into Motif Discovery. KDD 2017. Chin-Chia Michael Yeh, Nickolas Kavantzas, Eamonn Keogh (2017).Matrix Profile VI: Meaningful Multidimensional Motif Discovery. ICDM 2017.